Why do you train? Why do you show up at the box and put the work in? 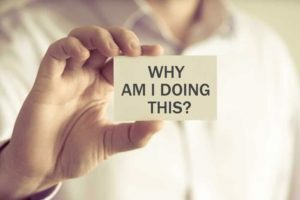 Why do you push yourself? Why do you deprive yourself of things? Hopefully because you have a purpose, a goal, a reason. A deep yearning inside of you that makes you do the things you don’t necessarily want to do? Now your purpose doesn’t need to be fitness related for fitness to be of help to it. Our members come to us for many reasons or purposes. For some it is indeed athletic performance. They wish to improve at their given sport or challenge. For some it is health and well-being. For others, part of their fight against the aging process and keeping up with the grandkids. For some pure aesthetics is the reason behind their time with us. Whatever your purpose is, is irrelevant really. The only thing that is important about your purpose is that it makes you hungry. That it gives you the energy to work towards it consistently and with passion. That it pulls you from the bed in the morning and burns inside you each moment you’re not working towards it. If you don’t know your purpose or don’t feel that passion towards what you perceive to be your purpose, then think. What in life do you want the most? What can you do to optimize your life and make each and every moment in it better or more fulfilling? Whatever you find I guarantee being fitter will help you achieve it or maintain. Now use that hunger to pursue your fitness and unleash your potential.